NASA astronauts Ricky Arnold (left) and Drew Feustel (right) are pictured inside their U.S. spacesuits for a fit check verification ahead of a pair of spacewalks. 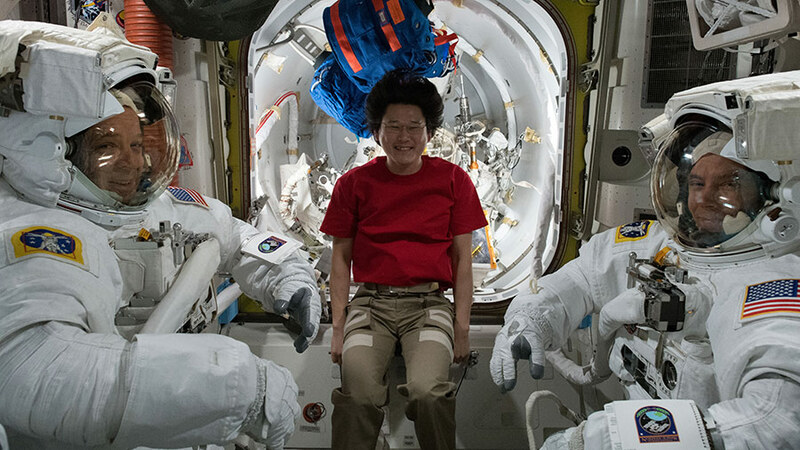 Norishige Kanai (center), from the Japan Aerospace Exploration Agency, assisted the duo in and out of the spacesuits during the sizing process. Expedition 55 Flight Engineers Drew Feustel and Ricky Arnold of NASA switched their spacesuits to battery power at 8:39 a.m. EDT, signifying the official start of today’s planned six-and-a-half-hour spacewalk outside the International Space Station. Feustel is wearing the suit bearing the red stripes, and Arnold’s suit has no stripes. Views from a camera on Feustel’s helmet are designated with the number 17, and Arnold’s is labeled with the number 18. Feustel is designated extravehicular crew member 1 (EV1) for this spacewalk, the eighth of his career. Arnold, embarking on his fourth spacewalk, is extravehicular crew member 2 (EV2).